It’s been a long hard day on the beach. You’re worn out from all that relaxing. And that makes you hungry and confused and tired. Where to go? What to eat? Shack up at Folly Beach’s iconic seafood source, the crab shack, where you can find all the fried, steamed, boiled, grilled seafood you could dream of. Buckets of little sea creatures you shell yourself? Yup. Deep fried fish to crispy perfection? They got that too. Grilled seafood more your style? Consider yourself served. Need some cracking pointers - find 'em here. Plus, they’ve got that special southern touch with their ocean-edibles. From hushpuppies to she-crab soup, this is the real deal, y’all. 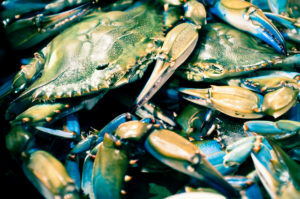 (and, until you can get there, try Tyler Florence’s take on she-crabs. Southern Living Magazine named the Crab Shack on their Top 10 Seafood Spots in S.C., and we haven’t even gotten to their Crabby Hour, Monday Open Mic Night, Live Music the rest of the week, and Weekend Brunches complete with Make Your Own Bloody Mary Bars. Add a raw bar, an outdoor deck, and shackaritas, and you’ve found your seaside home away from home! Get us there, ASAP.